French toast is a weekend breakfast treat, but when you're making it for a large group of people, preparing the bread and batter, and cooking it, takes a lot of time. Make it a little easier on yourself by preparing and soaking the bread the night before so that all you have to do is throw them on a hot griddle the next day. An even easier option would be to bake the French toast in the oven the next day, like a big casserole, so that all you have to do is cut it into individual servings. Lay out slices of bread onto a baking pan in a single layer. Use either a hearty crusty bread like French or Italian bread, or buttery bread such as brioche or challah. The slices should be at least 1 inch thick. Make your egg batter for the French toast in a large mixing bowl. You can use any type of French toast batter you usually make. A basic batter for every 2 slices of bread includes 1 egg, about a 1/4 cup of milk, a 1/2 teaspoon of sugar or brown sugar, cinnamon and vanilla extract to taste. Pour the batter all over the bread so that each piece is well soaked. Turn the bread slices over with tongs to coat the other side with the batter. Cover the baking pan tightly with aluminum foil or plastic wrap and place it in the refrigerator for up to 24 hours. Turn the bread once or twice during the time it is in the refrigerator. Heat a griddle or skillet for medium-high heat and grease lightly with butter the next day, when you are ready to cook the French toast slices. Cook them on the griddle as usual, about two to three minutes on each side, until sufficiently browned and fluffy-looking. Grease a baking pan with softened butter and cover the bottom of the pan with torn pieces of bread. Use French, Italian, brioche or challah bread. Make your egg mixture and pour over the bread pieces so that they are all sufficiently soaked. Cover with aluminum foil or plastic wrap and place in the refrigerator for up to 24 hours. Preheat your oven to 350 degrees Fahrenheit the next day when you are ready to cook it. Remove the foil or plastic wrap and place the baking dish in the oven. Bake the French toast uncovered for roughly 30 to 35 minutes, until the bread is golden brown. Cut the French toast casserole into equal-size squares before serving. 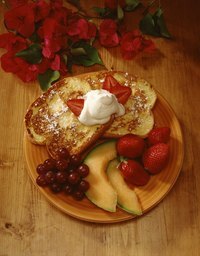 You can add additional ingredients into your egg batter, such as maple syrup, honey, orange zest and cocoa powder, to add more flavor to the French toast.